Make everything in your life possible because of JESUS. HIM possible. 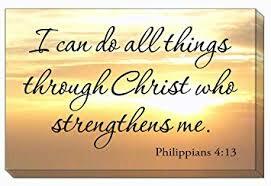 When we believe that we can do ALL things through CHRIST it all starts with a strong relationship with HIM. We gotta build our Faith and Trust in HIM to make things possible and give HIM the Glory. David to slay that lion and to wrestle with a bear and walk away victorious. David knew GOD was always with him and that’s why he looked at an uncircumcised Philistine (David never called Goliath a giant) and knew it was possible to slay him because he knew GOD was with him. Whatever Goliath you face, whatever mountain you might be standing in front of, the one truth you need to bury deep in your heart is: JESUS loves you, and when you place all your trust in HIM, HE will not let you be defeated. I’m not talking about going out and look to battle the enemy. I’m saying GREATER IS HE THAT IS IN ME THAN HE WHO IS IN THE WORLD. We need to ask ourselves – what are we willing to do or give up in order to put GOD in complete control of all aspects of our lives – to take things from impossible to HIM possible. We’ve got to stop looking at our options – things we feel we should do before coming or giving it to GOD. Don’t follow what the world is doing. Follow HIM. Are you willing to climb through a roof? Are you willing to bust through a crowd? Are you willing to step out into a storm and try to walk out on the water to get closer to JESUS, or are you just satisfied with staying with the security of the boat – in your comfort zone. John 14:12 this is powerful – Jesus said: He that believeth on ME, the works that I do shall he do also; and greater works than these shall he do; because I go unto my Father. WOW! Greater Works we can do because of HIM in us than HE did here on earth. All through the Bible you can see people getting in trouble, and when they turn to GOD, that’s when HE makes the impossible, possible. All the Miracles in Scripture shows us that NOTHING is impossible with GOD – from deadly diseases, tough times or dangerous situations, that’s when people call on the GREAT GOD OF GLORY to make the impossible HIM possible. I am so excited and Blessed that we don’t have to fight alone or figure things out on our own or even walk through this crazy world by ourselves . We have HIM with us, in us, and soon HE’s coming for us. Whatever you’re facing in your life now, turn away from it and face HIM. When you get GOD confidence, turn and face that situation knowing that this will not defeat me or destroy me. GOD loves me so much and cares about every detail of my life and if I cast all my cares on HIM I know nothing will be impossible with HIM. Take it to HIM, leave it with HIM, and believe HIM that nothing can defeat HIM.